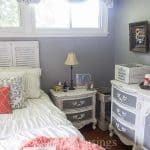 Learn how to decorate a bedroom for practically nothing using yard sale finds, thrifted decor and creative DIY projects. 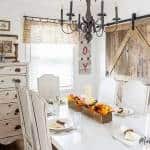 When I shared my master bedroom makeover a couple of weeks ago I told y’all it was a budget makeover where everything except for one or two items (and I mean EVERYTHING) was either a DIY project, a yardsale find or a hand me down. Now hopefully y’all know I’m a painfully honest person (just ask my family) but I thought I’d back up those claims with a few details. I would love to say I had this room all planned in my mind when we started, but that’s far from the truth! 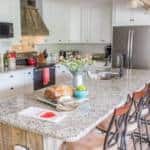 My husband and I are totally backwards than most (shocker) because we pick out the paint color first and go from there! Then when I decorate I literally go shopping in my attic and at yard sales to bring the room together one piece at a time. I think it would be delightful to go to a real store and buy all the accessories in one fell swoop, but where’s the challenge in that? The truth is this room means more to me because (much like our dream deck) it took some time and creative thinking to pull it together. Now I’m not going to show you all my tricks because hopefully you’ll want to come back for part two! 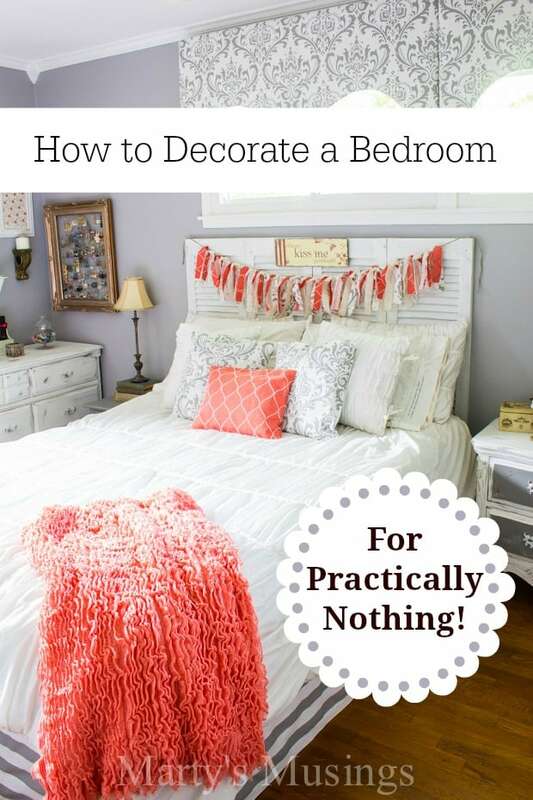 How to Decorate a Bedroom for Practically Nothing! Here’s a shot of one of the outside walls. The shelf was a $1 and it was perfect as is with the little pot with coral flowers (also $1). This little white milk glass vase was a $1 yard sale find that was previously in my chalk painted hutch and now stores bracelets. Details on the DIY Earring Organizer to come soon but I love the yard sale frame that I painted and Tim added chicken wire to the back for all these cute earrings! 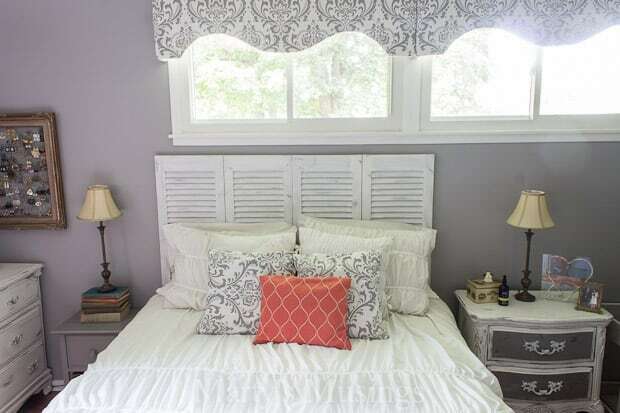 The white comforter was a hand me down from my married daughter and the smaller pillows were no sew projects. At $1 each these brand new pillowcases were a steal and are a treasure. 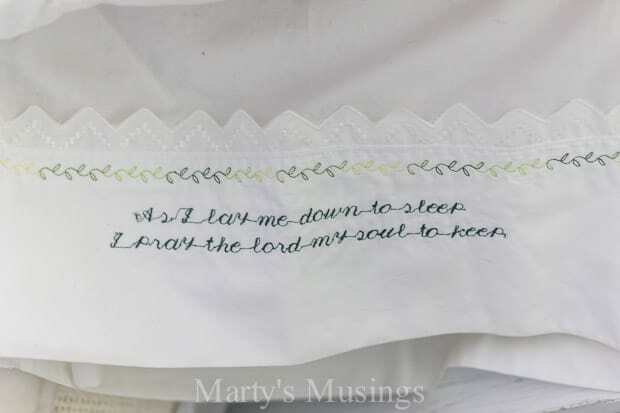 What a sweet reminder as I lay my (exhausted) head down each night. On either side of the bed are these matching lamps that were $5 for both. I know. A real splurge. I wasn’t sure when I bought them if I could make the gray, burnished gold and metals work together throughout the room, but I’m so glad I went with my gut and bought these! 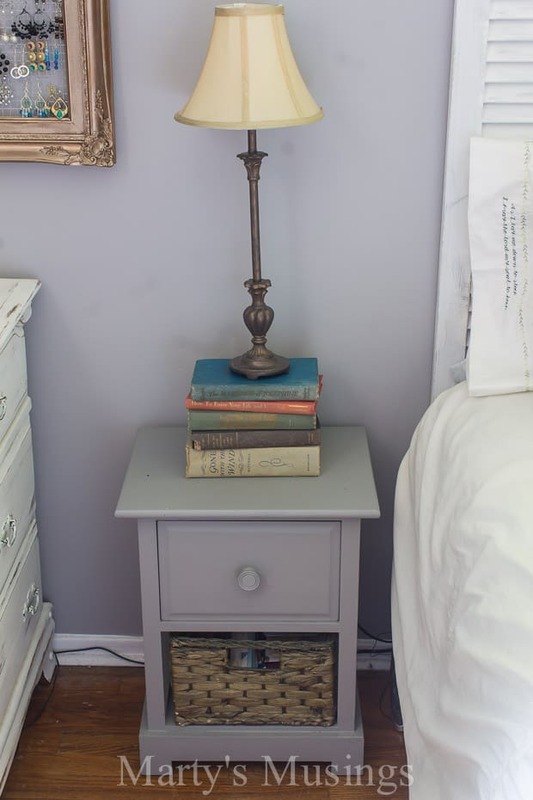 The side table was $5 and was painted in an accent gray. The basket houses my husband’s “stuff” next to the bed. Wasn’t I generous to give him a whole basket? Poor thing. The books were found in a box on the side of the road as we were walking through the neighborhood. I especially like the one entitled How To Stop Working and Start Living! Surely there’s a way to do both! 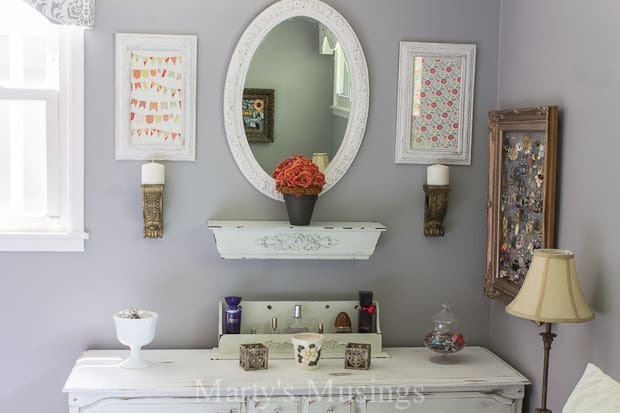 On this wall you can see the the yard sale frames and other items on the dresser. Would you believe if I told you these striped looking candle holders were actually wooden curtain rods a customer gave my husband? He just cut them in sections, cut out an opening for a tea light candle, and I grouped them all together in this little wooden box. 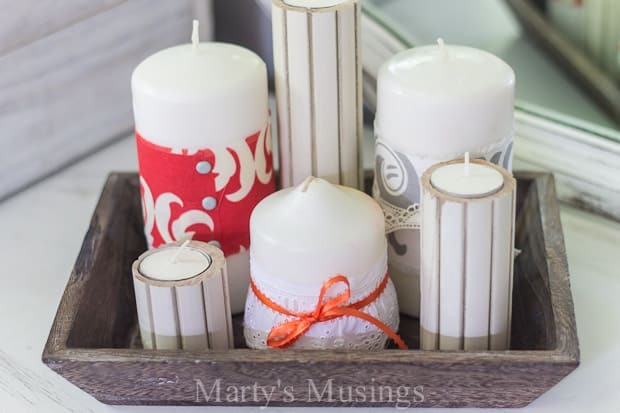 My favorite tip to make old candles new? Wrap with fabric and a little bit of ribbon! 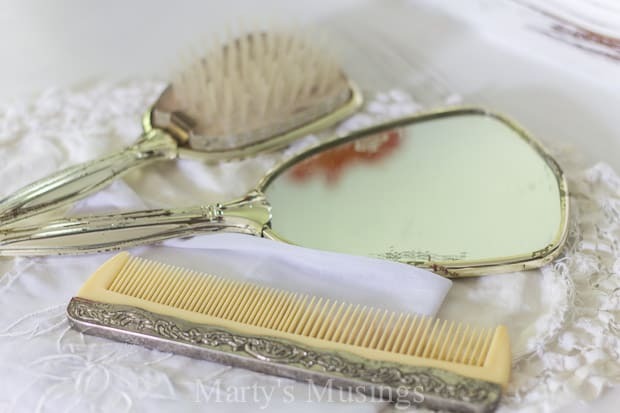 A vintage brush and comb set passed down from my mom rests on vintage handkerchiefs. Simple and free! 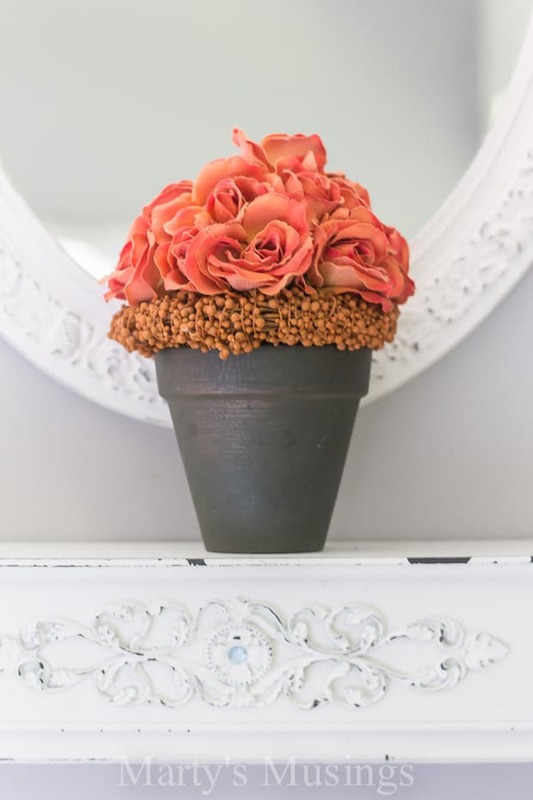 I know everyone should have real flowers in their bedroom, but let’s get real. How many of us have enough time or money for that? These silk ones add a pop of color to this $1 yardsale metal pitcher. I hope you enjoyed learning how to decorate a bedroom for practically nothing and that you’re inspired to make some changes in your own home without spending a lot of money! In another upcoming post I’m also going to share some before and afters on how you can buy thrifted decor and make it work for your style. 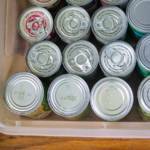 But until then take a look at this post for some great yard sale tips! I love that your beside tables/nightstands don’t match. I have having a terrible time finding matching nightstands for my bedroom secondhand! I’m so glad I’ve broken out of the matchy matchy mold, Felecia. I think the paint really unifies the room as well. That Gone With the Wind book is very old, my Mom has one just like it. 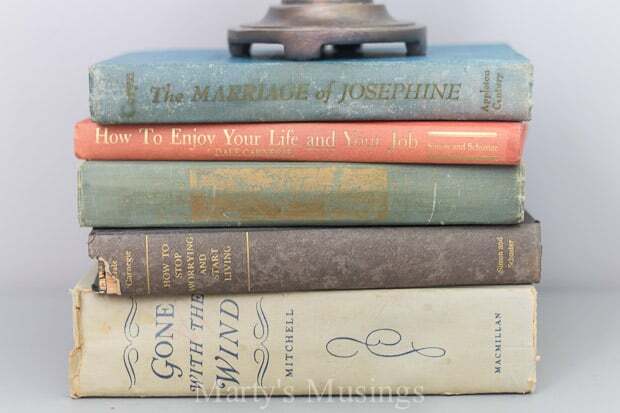 I think old books add such character to a room. You did a wonderful job, thank you for sharing. Hi, Dara. I should check my old books to see if any are very valuable! I’ve always loved to read so that makes the books even more special. Thanks for visiting! What a beautiful and unique room! All your pieces have ‘personality’, not cookie cutter like so many others! That $1 milkglass is Indiana Milkglass. It is worth about $15- $20! GREAT JOB! I collected it for years and it still makes my heart pitter patter! LOVE your room! Hi, Kelly. Thanks so much for the compliments! My bedroom is definitely not cookie cutter! So good to know about the Milkglass. I really don’t know a lot about the styles, just that I love the white and the way each piece is so unique. I loved your line about starting with the paint color first. That’s always been my first step when starting a space. We think alike then, Cathy! 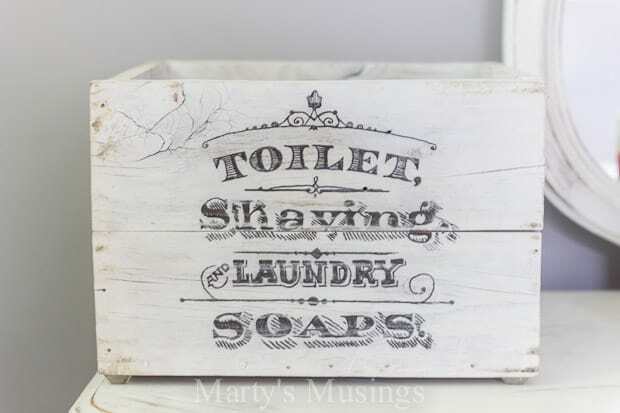 Thanks for visiting Marty’s Musings! I love those on-the-side-of-the-road deals one can get like your books. So fun! Lovely deals and beauties you have upcycled!! Hi Ouida. I hope to post the details on the headboard soon. If you subscribe via email you’ll be able to see when I post! Thanks! Hi! Just wondering what size chicken wire you used. DO you think that hardware cloth or netting would work as well? Hi, Nancy! Here’s what my husband says: The chicken wire I used was 1/2″ x 1/2″ squares on a 36″ roll (width) and purchased from Lowe’s. I’m not sure the cloth or netting would work because, even though we’re talking about ear rings here, there is some weight involved. You don’t want things to sag over time and make access awkward. 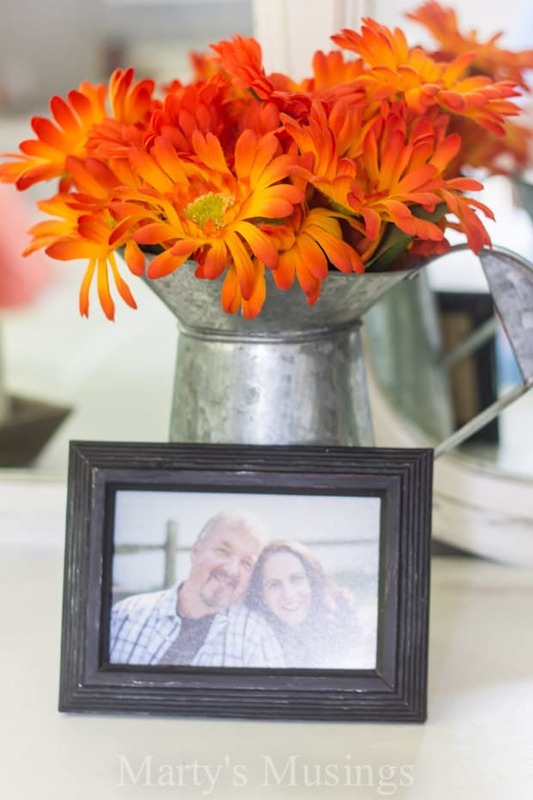 I found that the chicken wire, once securely attached to the back of the frame, was perfect to hold the plethora of items my wife managed to hang there! Super ideas all incorprated into one room! You did a beautiful job and it’s even more impressive on a budget:) Loving the colors too 🙂 Pinned and sharing! you did wondeful job on your bedroom. 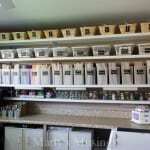 I do the sme thing decorte spending little or no money just some time nd love doing it and the results are great! Where did you find the pretty coral colored accent pillow that is on your bed? I have been looking for fabric in that exact color and have not had any success as of yet. What’s the name of the grat you have there it’s so fab! It’s BEHR Premium Plus Ultra, Interior Eggshell Enamel, Pewter Mug 770E-3. Just ran across your musings 🙂 .I enjoyed reading about all of your great buys. Will be checking back. Thank you, Janet! 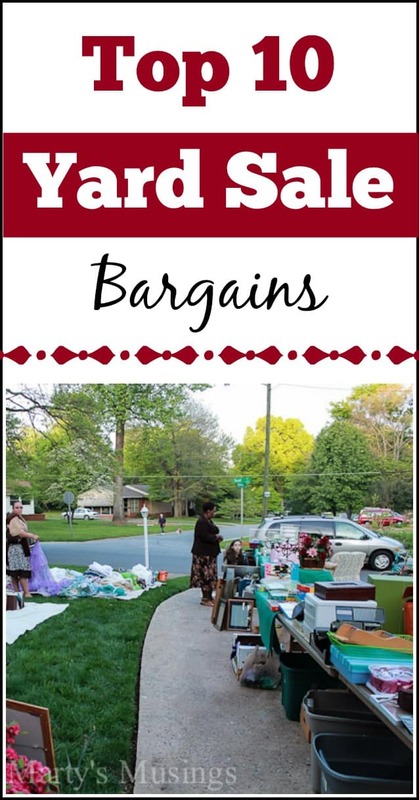 I’d love if you’d join my email list because yard sale season is coming up and I’ll be sharing my latest finds soon! You can subscribe at the top right of the blog and you only get an email when there is a new post. Have a great day! I love your style, Marty! 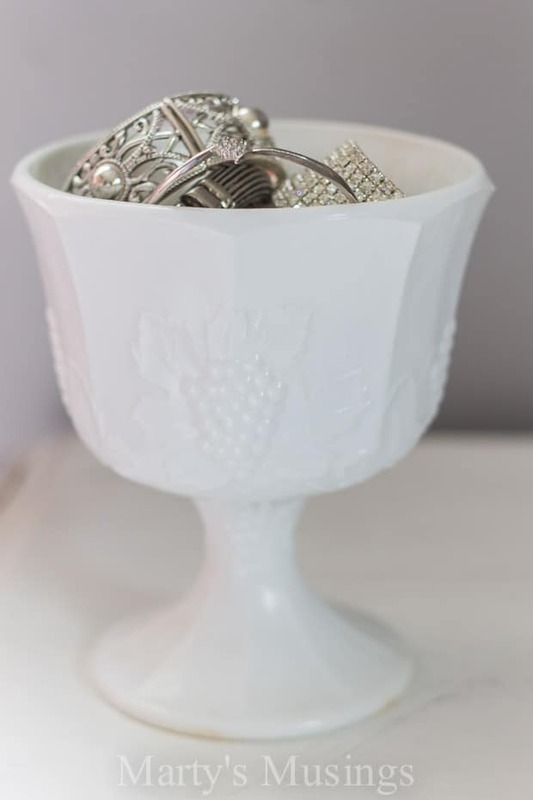 You have a great knack for putting it all together … and its beautiful! I’m with you on choosing the paint color first – is there any other way?? 😉 I’ll be checking back often for additional inspiration. Blessings! Hi, Mina. Thank you so much for the compliment. I love that someone else picks the paint first! I’m not sure that’s the easiest way but it’s my way! Please subscribe via the box at the top right of my page and you’ll never miss a post! Thanks for visiting! 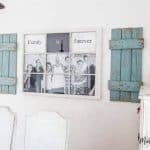 I had an old antique picture frame I found in the attic when we cleared out my in-laws house and I used regular metal window screening. The frame was gold so I lightly sprayed the aluminum wire with gold. I hang all my French hook earrings from it and made some hooks to hook on the wire that enable me to also hang my hoop earrings on it. Sounds beautiful, Ann. You have something special from your in-laws and something practical as well. 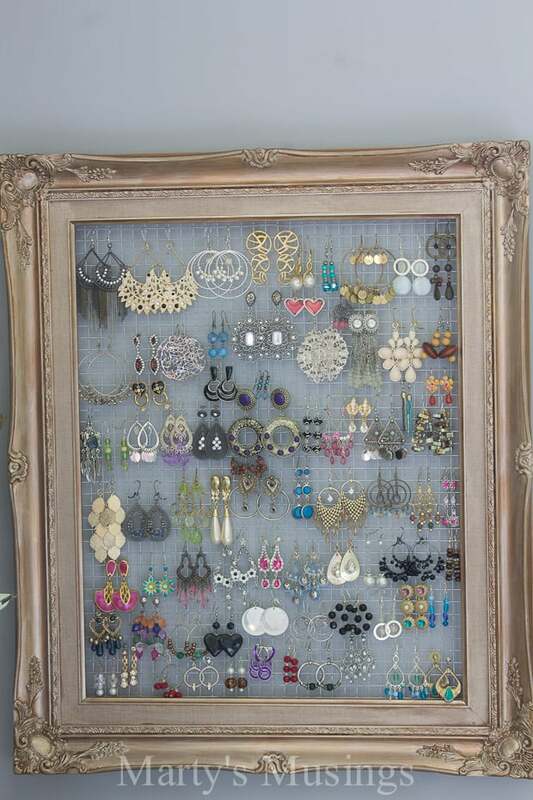 I love my earring organizer and use it all the time. The only problem is my teenage daughter does as well and I have to search for my earrings because they move around! What an awesome collection of decorating ideas! 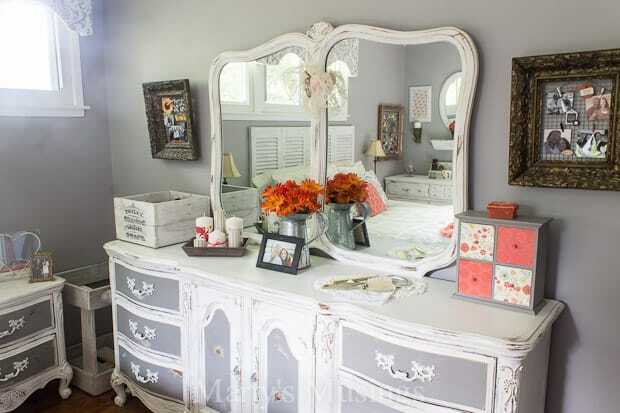 I absolutely adore your bedroom, it’s incredible! Thanks for sharing!